The finest character map for iPad and iPhone. Now with custom keyboards you can use in any app! Copy characters to clipboard and paste them to other apps, like web, mail, chat, notes... any app! Notepad with customizable keyboards, for quick editing tasks. Use them in any app! Great for scientific and math notation! Copy characters to clipboard and paste them other apps, like web, mail, chat, notes... any app! 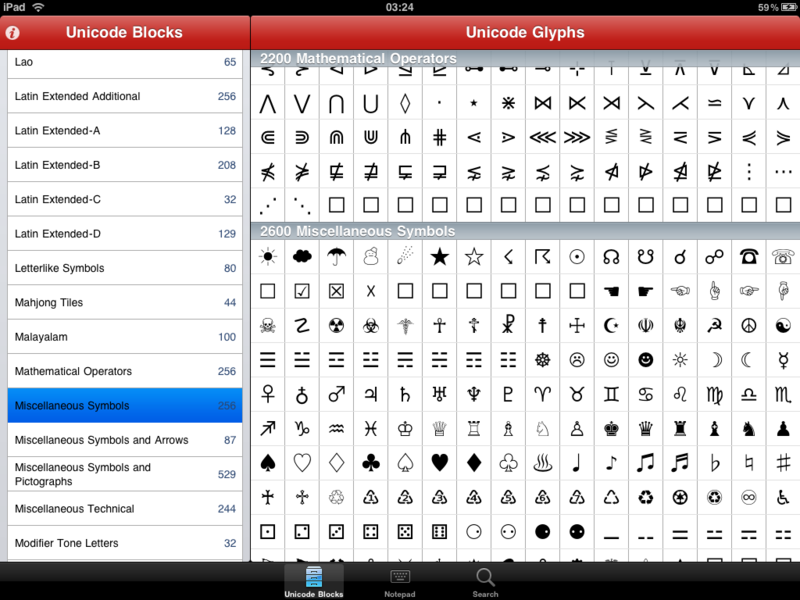 Unicode Pad Pro app lets you browse and use thousands of fun and strange characters defined by the Unicode standard. It includes a text editor with customizable keyboards and fast, smart search. We believe that Unicode Pad Pro is the best character map application in the App Store, far superior to anything else available!!! 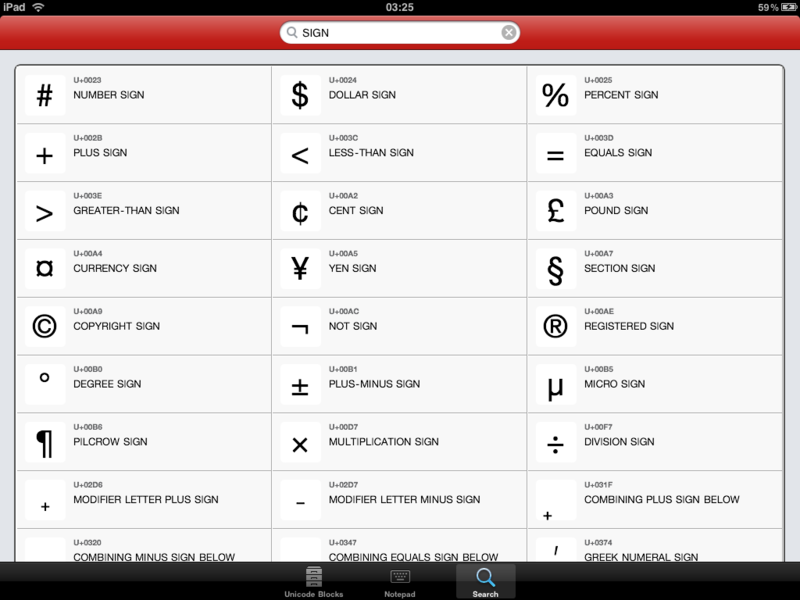 Huge selection of symbols (thousands), in fact all that are available on your device. 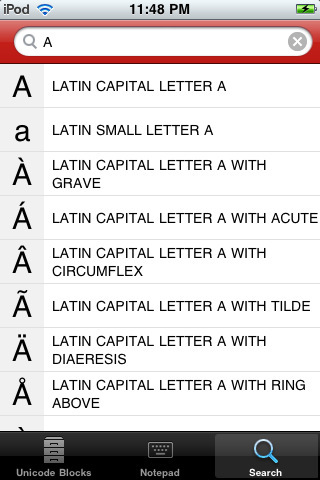 Database itself actually contains data for all Unicode characters (over 113,100), but only glyphs available in iOS system font are actually visible. 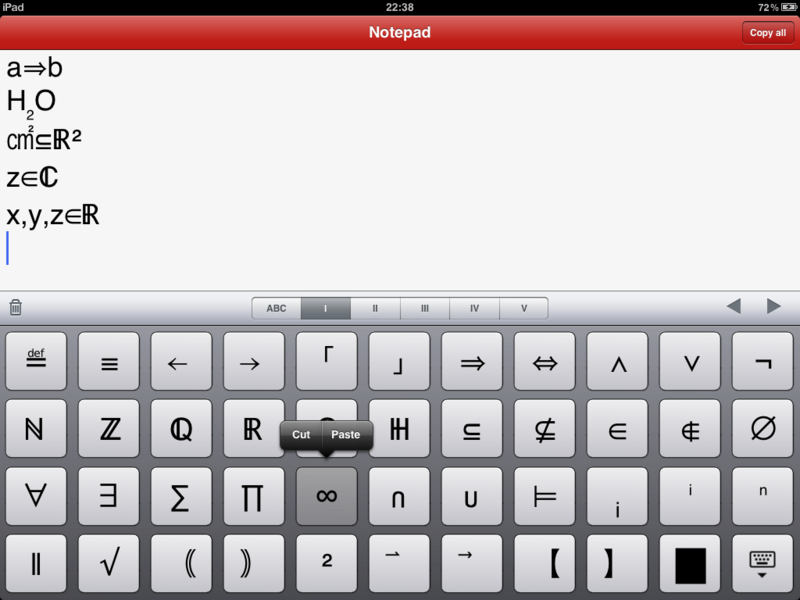 Notepad with customizable keyboards, for your often-used characters and for copying several characters at once. Great for casual writing, too! 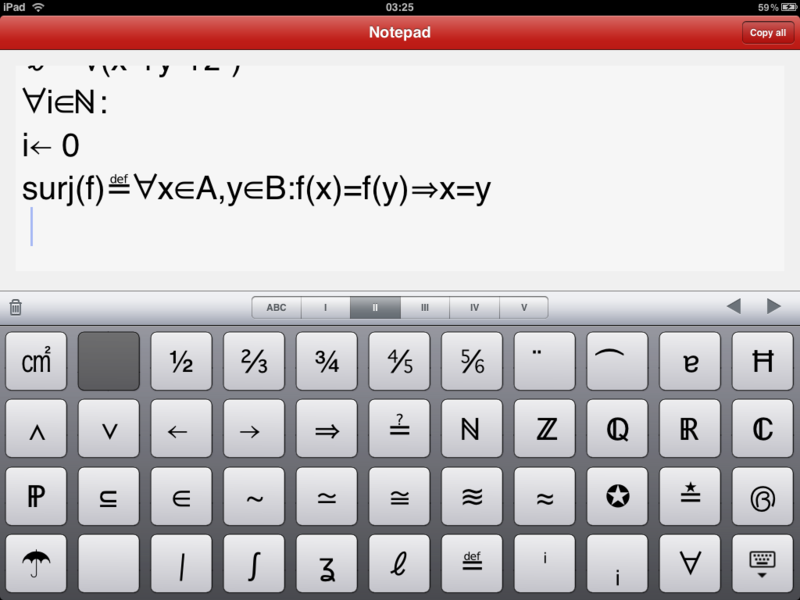 Copy characters to clipboard for use in other apps, like web, mail, chat, notes… practically any iOS app! Use your custom keyboards in any app! Share your custom keyboards with your friends! Support for Unicode 10.0 standard, which has many new symbols, including emojis! Extended fonts covering many characters otherwise not available on iOS. Download additional custom keyboards from the internet repository. Streamlined design, specifically optimized for each device. Support for all device orientations and Retina™ display. Autorepeating cursor keys. Also, you can drag left and right on custom keyboards or text editing area to move the cursor even easier! Optional Backspace, New Line, Shift and Alt keys on custom keyboards! Custom keyboard sizes up to 6×16 = 96 keys! Set notepad font size and family. Send mail and tweets right from within the app! Search for characters by name, hexadecimal codepoint or glyph! Find similar and related characters instantly! View extended character descriptions on Wikipedia, right inside the app! This works particularly great for emoticons! One universal application works on iPhone, iPod and iPad! Reference booklet of characters available on modern computers! Paper Unicode maps are over 1000 pages long! Developers: see which characters are available on your iOS device! Great for scientific, mathematical and physics notation, handles many superscripts, subscripts and other symbols! Great for writing Unicode poetry! Great for making interesting app names! Great app. Worth 10 times the price! This app is so wonderful. It’s great for creating any kind of design, or writing in pretty fonts. It’s also great for writing in different languages. It’s a must have. I just wanted to say the latest upgrade is great. To have access to the wider language scripts in Unicode, such as cuneiform, Egyptian hieroglyphs and others, is a vast improvement. Brilliant! 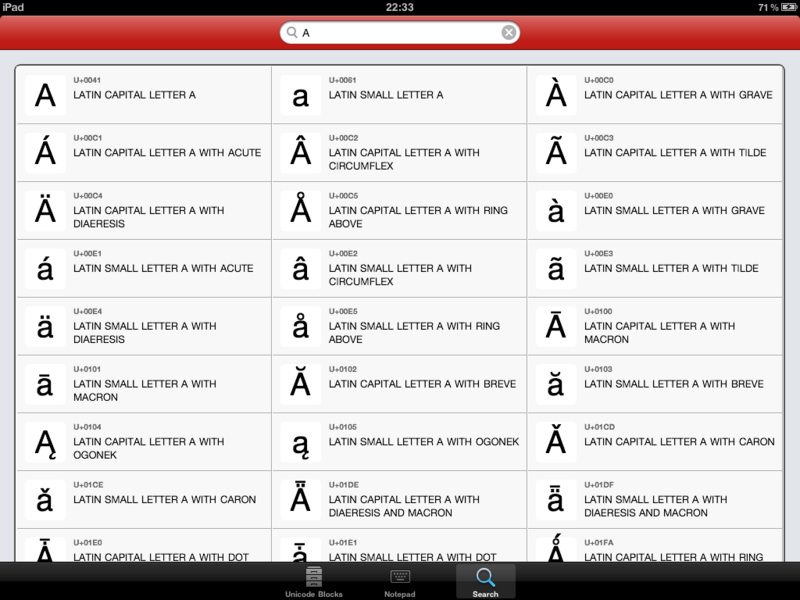 This beautiful app is a godsend for all those who have bemoaned the lack of phonetic symbols and fonts on the iPad. 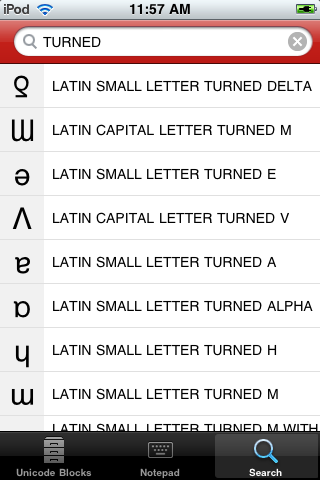 With the Unicode Pad one can easily find and copy (even to a custom keyboard) any of thousands of characters from writing systems as diverse as the Akkadian, Chinese, and Cherokee scripts. A boon for those working with languages! 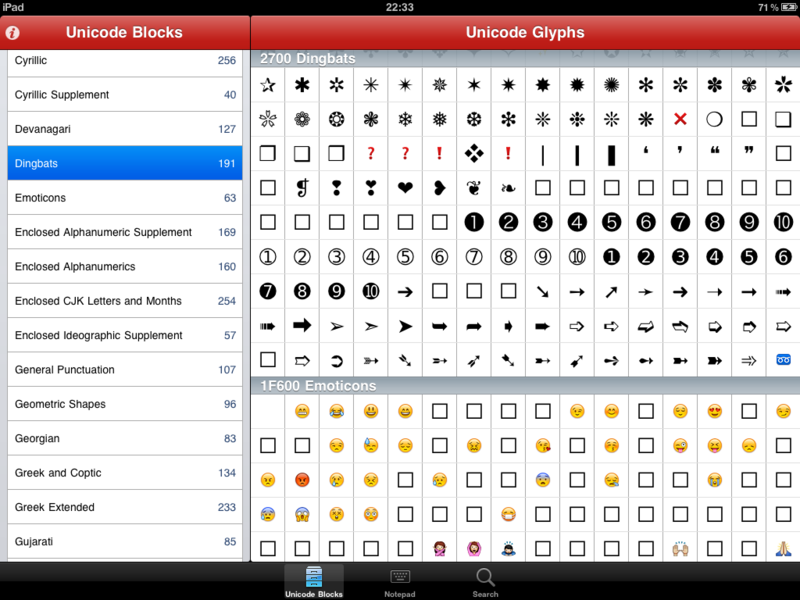 I especially recommend the Unicode Pad Pro version, which costs only slightly more than the standard one. Both are excellent and inexpensive. 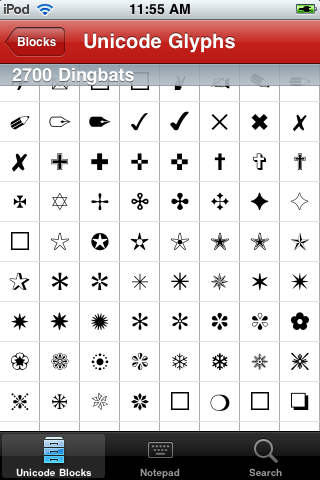 The iPhone and iPad can display many character glyphs; Unicode Map gives easy access to them all. Very nicely done! Clear, clean and simple, yet complete catalogue. Fast and stable app. 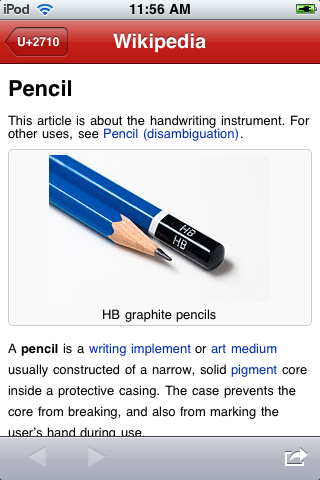 Love the button to pop-up the Wikipedia page for a glyph. My one wish would be for a option to ‘Copy as HTML’, only that might be ‘a button too far’. It is all so sweet just as it is. Talk about full featured, you can even create and email keyboards! Works beautifully. Finally an app that allows me to use my iPad in ways I could not before. Thank you for making Unicode easy. This should be a standard iPad app. Now I can finally insert my frequent symbols ² ½ ← → ± ∑ Ω ∞ ° ∅ ⊕ ⊖ Love the cursor keys, if only the standard keyboard had these! This is by far the best “special characters” app. In a nicely designed layout, it gives access to EVERY character the iOS can produce, including all the fancy emoji available, lots of math/logic symbols, and languages like Tibetan. Plus it allows you to set up your own keyboard, if by chance you need to write in emoji, logic, or Tibetan on a somewhat basis. This one app can replace about 1000 others. What’s not to like? The iPad natively includes many (though by no means all) Unicode characters, but the iOS keyboards don’t provide users easy access to those characters. 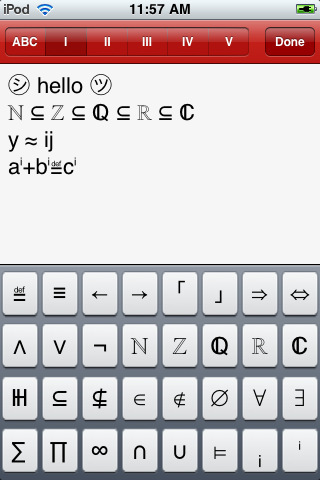 This app opens up a whole world of possibilities for Unicode text entry. I’ll be using it primarily to enter Hebrew text with nikkud, but anybody who wants to access characters that aren’t on the system keyboards should definitely give this app a whirl. It’s become an important part of my workflow within hours of purchase. As a college professor, I especially appreciate the function that allows me to share my custom keyboards with students and colleagues. Before you buy, though, be sure you understand that you type the text within Unicode Maps and then copy/paste to get it into other apps (including web pages that accept text input). The app doesn’t modify the system keyboards. One suggestion for future development: add a backspace/delete button to the bar above the keyboard (where the right/left cursor and keyboard selection buttons are). I tried many Unicode apps and I like this app very much. The main page has many custom catalogs. They contain various related characters. The custom keyboard function is very good, too. I got rid of all Hindi & Gujarati transliteration apps after installing this app. The search function works well. This app needs some improvements that’s why 4 star rating. Must have app to view all the characters that can be displayed by your iDevice. 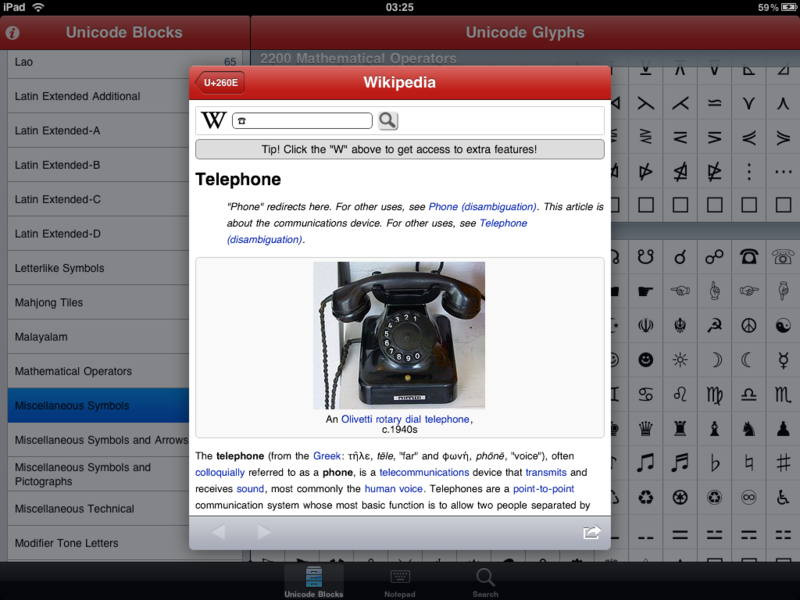 This is an excellent app for including a very wide range of characters and symbols not available as standard on the iPad. Very simple to use and well designed. It completely solves my problem of introducing occasional mathematical symbols and the range of number symbols in non Latin scripts is very good too. A generalist rather than specialist package, but that is what I wanted. I love your Unicode maps! I wasted money on Easy symbols and Character Pad. You would not believe how many science guys out there would buy this app if they knew it could do negative exponents and subscripts alone. 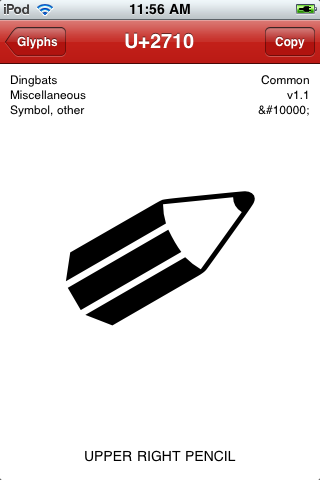 The simplicity of this app is it’s strength: all the Unicode characters (there are thousands) are here, shown in their respective categories, & with a couple of clicks can be copied to the clipboard, added to your favourites or – a brilliant feature – you’re taken to the Wikipedia article about that symbol! Plus, the definition/meaning of the symbol is shown beneath, great for all those foreign letters! All in all, this is a superb app, simple, streamlined & very useful indeed. I highly recommend this to anyone who needs to insert more special characters than what can be found on the iPad keyboard (even with using all the tricks like holding down keys). Thanks to the developers for making a handy app! No other Unicode-table app has so clean a presentation, or so flexible an entry technique — and it’s universal, and the iPad layout is done properly and intuitively. Tried all the others, and I do mean all, paid versions and free. 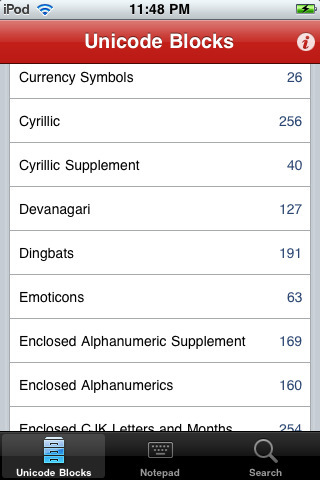 This is the only Unicode app I’ve kept, the only one that’s proven useful. I guess it would be nice to be able to sort blocks by their code as well as their name, but now I’ve got the hang of it I think it is a great app! It does exactly what I want and being able to search on character names (eg “question” or “star”) is brilliant! It’s a shame apple hasn’t added the ability to use these keyboard within the OS, but this solves it all! I’m glad this app keeps growing, and I hope to see more updates! Seldom, if ever, do i write a review. This app is well done. 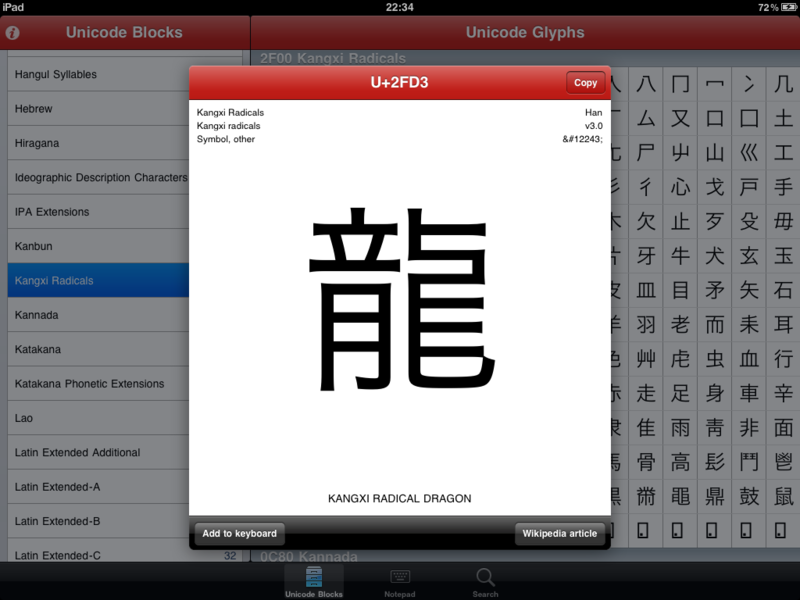 If you an interest in Unicode… This is the app. Thank you for such a fine application and you can count on my support! I’m a Unicode junkie, thanks now especially to Unicode Map…. The best Unicode app I’ve ever tried. Amazing app! Great for makin names on other apps!! I think that you’ll be surprised at how useful this App might turn out to be. I find your Unicode Maps app very useful. Thanks so much for this very useful and easy to use application. I like your app as it gives a flexibility to iPad. Ꭶͥͪͭ ༷‣₳₱₱ྀ ℹ౭͎ऀ ᎪۛᏔ͢ᎬᏕᎾ͡ᎷᏋೢ՞❥͎✧⋆ I ಇ it ☺ Its really fun. Hi. I have the unicode app and I love it. Scripts can now be sorted alphabetically, by region or by age. Infobox now displays all codes in composed characters correctly. This also works great for new emoji! All unicode blocks at least partially covered now! Glyph shadows on keys are gone! Handy character info display in notepad (iPad only). Tap to select. Tap again for more info. Support for extended fonts, greatly expanding a number of visible characters. Super cool cursor movement gestures – drag left and right in notepad text area to move the cursor! Search improvements – now comments are searched, too! Eliminated unnecessary long press gesture to bring up the keyboard menu. Now just tap! Drag your finger left and right on custom keyboard to move the cursor. Awesome!!! Custom keyboard size can now be increased up to 6×16 keys! Cursor keys autorepeat! This is fun!!!! The UnicodeKeys keyboard extension requires “Allow full access privileges” exclusively to access custom keyboard definitions in the main Unicode Pad Pro app. No data is passed from keyboard extension to the main app. The main app itself collects no personal user data.